We’ve probably all been guilty of neglecting our emails at some point. 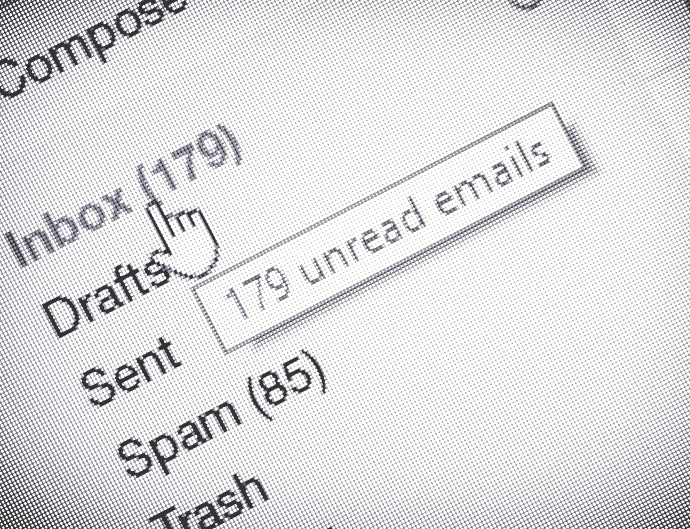 Think about it – right now, how bad is your inbox? How many unread messages do you have screaming your name? An overflowing inbox can feel overwhelming and affect your productivity, or cause you to avoid tackling them all together! Everyone has their own way of managing their email, some structured and some not so much but no matter your style, we’ve scoured the web to find some handy tips to help you battle that inbox and start fresh. If you haven’t read each and every email by now, what’s the chance that you ever will? You may not necessarily need to read certain emails but you do need to have them saved, just in case. So sweep them up into folders rather than having tem sitting in your inbox – it’s a lot quicker and way more efficient. When you do a clean-up, run a search and move a bunch of emails into that folder – its way quicker than doing them one-by-one! However, anything that needs my attention is to stay in my inbox until actioned – think of filing emails away as a tick on your checklist. It’s the ultimate satisfaction those of you who love a good list! It’s time to take your name off those lists that you haven’t read in forever. Luckily for us you’re reading blogs right now! If you haven’t read it in the last 3 months chances are you won’t in the months to come. The Apple new IOS makes this even easier with unsubscribe in the header. We all know you subscribe for a reason but even if it’s your favourite shop don’t be afraid to unsubscribe for now and come back later. Do you find yourself hovering over that delete button and just not being able to do it! If you haven’t needed an email or referred to it recently memory – make space and remove it or place it in a folder so it’s safe for reference later. If you come across an e-newsletter or mailing lists that you know you won’t need, organise your email by title or sender, or run a search and delete or move them all at once. You feel better already, right? If you aren’t quite ready to make the big move, create a folder called “Later” and come back to it with fresh eyes. Now that you’ve swept up and taken out the trash, you may like to create mailbox rules so that your incoming emails are sorted automatically! For those daily reports you get at work but don’t need to look at until later, you can create a rule that will send them straight to a nice little folder for easy access when needed. You should be able to do this with almost all email accounts but Outlook and Gmail are pretty good at allowing you to do this seamlessly. Business – all thing work. Personal comms – emails from Nanna Jan, incoming bills, and those online shopping receipts you are keeping hidden. Bulk emails- those newsletters, business promotions and mailing lists you may want to be in but don’t always get time to sit back, relax, and read. Why not create separate files for each of these types of emails, or maintain 3 different email accounts – it will come down to what works best for you. If you work by topic, think about creating folders by key word, e.g.“Bills”. If you sort by time you may prefer to create folders by year or month, e.g. “2016,” “2017”. Now they’re out of the way, but not deleted, you can start fresh. Labels are your best friend! Outlook and Gmail utilise these well and allow you to group related messages. Remember – the difference between folders and labels is that a message can have multiple labels but only one folder. These labels can be brightly colour-coded for easy reference (and of course to jazz up your inbox). Are you guilty of leaving emails on your phone screen or setting reminders on your phone so you don’t forget to reply? I sure am! There is a pretty neat plugin called Boomerang for Outlook and Gmail that will allow you to schedule an email to disappear and reappear later when you have the time to respond. Now that’s convenient! Now it’s your turn! Give it a go and let us know how you went downsizing your unread mail. Or, if you have a great tip for staying on top of your emails, share it in the comments! Wonderful suggestions! Keep them coming…..
You may like to checkout these tips on how to reduce spam emails https://iihelp.iinet.net.au/Receiving_Spam_Emails. A HUGE inspiration. A lateral way of thinking. Now all I have to do is get to work. Thank you, Erin. My injured foot tells me to sit and do this task. While you’re resting this is the perfect opportunity to get started on that inbox! Great tips, just wish my husband would take note of some of them. Maybe try printing a copy of this article and leave it lying around for him? Very limited control of fonts an font size is a drag. Yor email is limited, in that I can’t put stuff in floders. I know it is a basic email service, but a bit more usability would go down well. You told us what to do, but never how to do it.How can all the unwanted advertising emails be blocked? For some tips on how to reduce spam emails checkout https://iihelp.iinet.net.au/Receiving_Spam_Emails. This is a query but the article is good. How does one get rid of -permanently delete off the server, files that have been sent to the trash/deleted items and deleted from there?? Every time I try to delete the contents of the deleted items folder in Outlook, they just all reload!! I’m definitely guilty in this area. Will endeavour to clean up my act. How can I BLOCK an unwanted supplier/junk mail/ spam, from my iiNet email account. .? I know I can change my iiNet account to Outlook to perform this action, but that’s a lot of trouble notifying all my contacts. It should be possible from within iiNet. You did not mention about all the spam mail that comes in ??? For some tips on how to reduce spam emails you may like to checkout https://iihelp.iinet.net.au/Receiving_Spam_Emails. Since I have used your system for a number of years BEFORE IINET took over from OZEMAIL (as shown by that fact) and since my GMC computer with WINDOWS XP is easily EIGHT YEARS old, we are sort of rather “long time” associates! My age is now over NINETY and am getting “slow”! Thank you for your help and patience for so long. Best wishes for your future prospeity. There is no reference above to what happens when one places an email in the SPAM folder in iiNet webmail. It would be interesting to know what iiNet is doing with the aid of the folder to reduce spam, and in other ways too. You can checkout some tips related to spam emails here https://iihelp.iinet.net.au/Receiving_Spam_Emails. ps and they are in “plain english”!! Good luck – let us know how you go! If iiNet fixed their spam filter it would help a lot. It’s only been 8 years and still doesn’t work the way it should. I’ve complained about it half a dozen times and still get the same response… ït’s been looked in to”. When marking an email as spam, it should flag ALL future emails from that address as spam, it doesn’t. Fix the thing!!! do not know how to enlarge the really tiny font that has suddenly presented itself. Please help. Depending on your mail software, you can set up filters to catch certain e-mails and put them into folders, ready for deletion. Hi, I aggregate all of my emails into Outlook and move them from the Inbox to Folders. Does this remove them from my iinet email online Inbox? I was expecting an important email via my iinet email and hadn’t received it. When I checked iinet email online, the Inbox was completely empty, not a single email was in any iinet folder. Is there some limited time period that they stay in the iinet Inbox? Once you download the mail to your computer, it is permanently removed from our mail servers and so isn’t able to be recovered, so it sounds like the mail has been downloaded to your e-mail software. Did you know that you’re able to do this via Toolbox? This includes the ability to remove yourself from any e-mail lists you may be on. If your mails have disappeared from your mailbox when you view it in Webmail, then its usually likely that you’ve actually downloaded them to your primary computer. This is usually in conjunction with a setting in your e-mail software that will have mail deleted from the mail server after 5 days (once downloaded). Does iinet / webone email have the facility to filter mail containing specific words and put that mail straught into the bin? If so, how is it done? Hi, how can I delete the old folders I’ve created in my outlook (from my old laptop) onto the webmail? Thanks for reaching out and commenting on the blog! First step is most certainly to make sure that any emails you want to keep that are in the folder are moved out to a safe spot (or another folder that you are wanting to keep). Once you’re sure that there’s nothing in the folder you are wanting to keep it’s just a matter of firstly selecting the folder and clicking on the negative sign in the bottom left underneath where the folders are listed. If this is still open, I am looking for details advice on how to use the Search box in Webmail so I can find a cluster of emails that meet the criteria and then deal with them as needed. The Advanced Search box, using myriad of possibilities and combinations, rarely brings up the right results. I have even done a search when I can see an email that meets the criteria in the left column but the results of the Search say nothing matches. Frustrating! Hope you can define the search criteria that the Search box fields are looking for.